January 20th is a trifecta of food holidays: buttercrunch, granola bars, and cheese are all celebrated. With so many sweets being honored this week (and, well, always), we didn’t want to tackle buttercrunch. For the record, it’s a toffee-like candy similar to Almond Roca or peanut brittle. Shout out to buttercrunch! And unwrapping a granola bar seemed too easy. I eat granola bars at least once a week for breakfast. Cheers to the granola bar, but today is not your day to shine. Since Tara and I are both cheese lovers, we’re celebrating in the cheesiest way imaginable. Cheese dates back to prerecorded history, and was discovered by accident. Ancient folk seldom got together for Tupperware parties, so they used animal skins and internal organs to store their food. It is believed that an Arab trader stored milk in an animal’s stomach. The rennet from the stomach turned the milk to curds and whey. No, the trader’s name was not Little Miss Muffet. Hieroglyphics in Egyptian tombs dating back to 2000 B.C. depict cheese making, and Homer describes the Cyclops as being a skilled cheese artisan in his epic Odyssey (“We soon reached his cave, but he was out shepherding, so we went inside and took stock of all that we could see. His cheese-racks were loaded with cheeses…”). When even a one-eyed mythological giant digs cheese, you know its popularity is going to explode, and sure enough cheese became a staple throughout Europe and the Middle East. Not so much in Asia, which is why you never see cheese on Chinese menus, but they’ve perfected moo goo gai pan so it’s all a wash anyway. Cheese is often condemned as being unhealthy and leading to heart disease, but some of the countries best-known for cheesy diets – Greece and France – have low incidences of cardiovascular disease, so the jury is out on that one. It’s okay to love cheese! (Except for Velveeta and Cheez Wiz. Neither one of which is real cheese anyway). There were dozens of ways we could have celebrated this holiday – mac ‘n cheese, grilled cheese sandwiches, cheese omelets, tacos – and hundreds of varieties to choose from (cheddar, muenster, jack, parmesan, string). Narrowing our options down was tough, but we decided to leave the cooking to Gustav’s, a German restaurant known for their cheese fondue. Theirs is made with swiss, and is amazing. Holes and all. Hope you enjoyed the fondue. Looks pretty tasty! Stay Cheesy! 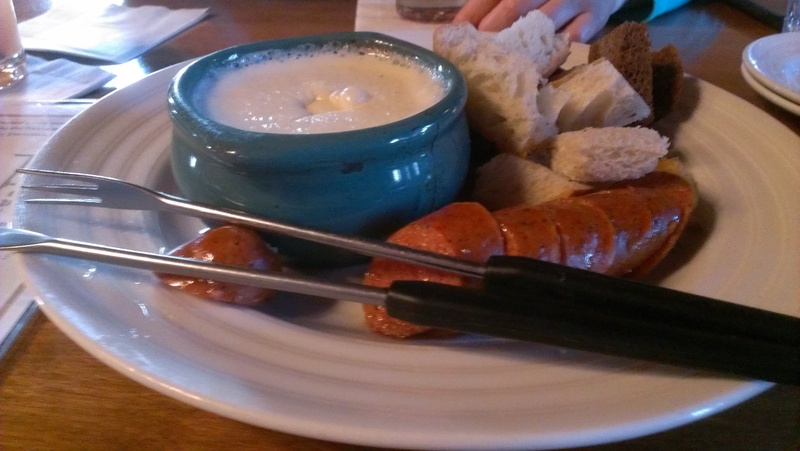 The fondue was fantastic! So too were the things we dipped into the fondue. Can’t go wrong with bier sausage! I had some almond buttercrunch still in the freezer from what I made over Christmas. Think I’ll go get a piece! I wish we still had some left, too. It was really good! We weren’t really planning ahead yet waaaay back in December. Hey, dont knock my velveeta-nothing better than a grilled cheese sandwich made with velveeta! I’m not knocking your sandwiches, mom – but I wouldn’t call them “cheese.” Maybe if it was National Cheese Product Day or something, that would be acceptable. Have you ever had cheese curds? The fresher the better. When you live in Wisconsin, cheese is almost a way of life. Yes, we’ve tried cheese curds. I’m not a big fan of “squeaky cheese,” but Tara likes it. Hey – role reversal there! Well, I second Sandy, cheese curds are amazing – cold or fried. But cheese is definitely a favorite in my house! Whenever Joe and I have an at home date night it’s a favorite to cut up fancy cheeses, meats, and mustards or jellies to pair with a nice bottle of wine! Yum! Enjoy! You just said the magic word, Jess: “fried.” THAT is something I could get behind! And by the way, if we’re ever in Wisconsin, we are so hitting you up for a dinner invite!